The unique Sterimar microdiffusion technique consists of a GENTLE FINE SPRAY of sea water onto the nasal mucosa. 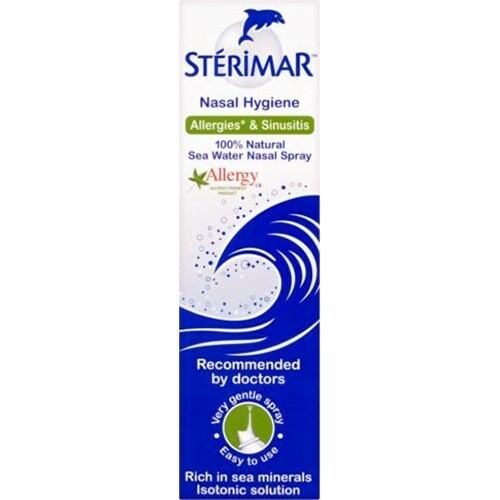 The droplets of seawater produced by Sterimar are extremely fine, and so remain in contact with the nasal mucosa for a longer period. This prolonged contact enhances the penetration of the nasal mucosa by the trace elements. Each dose of Sterimar delivered is aseptic. The anti-reflux valve prevents air from entering the can. The solution remains perfectly aseptic after each use. Sterimar can thus be used safely again and again until it reaches its expiry date, even after multiple uses. The microdiffusion effect is produced by the specially designed Sterimar nozzle. The Sterimar exclusive nozzle is anatomically formed and self-blocking : it can be used as safely on the tiny nostrils of a baby as on those of an adult. Its graduated diameter adapts to all nostril sizes and prevents any risk of accident when inserting the nozzle into a baby's nostril. (NB: The nozzle is incapable of causing injury or of penetrating too far into the nostril). Gently insert nozzle into the nostril. Spray briefly, and allow a short time to take effect. Clear the nostril by blowing gently to remove congestion.